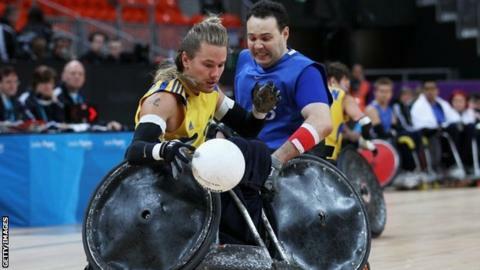 When it comes to Paralympic sport, wheelchair rugby wants to make a big impact at London 2012. Known to many as Murderball, thanks to the documentary film about the sport which focused on the highly successful US team, it is not a game for the faint-hearted, be they participants or spectators. The hi-tech aluminium and titanium chairs which the players use are specially made to withstand plenty of on-court crashing, bashing and smashing which can leave players prone on the court, but at the same time there is no shortage of skill on show in a game where men and women play together on the same team. GB suffered the heartbreak of losing out in the bronze medal play-offs at both the Athens and Beijing Paralympics, and despite being four-time European champions they have also failed to deliver a medal at the World Championships. But those involved with the team believe that they will be in the mix for medals again this time around and they can finally make the investment in the team pay off. Performances at this week's Paralympic test event at the Basketball Arena, which will also host the event during the Paralympic Games, certainly indicate things are moving in the right direction for a GB team ranked sixth in the world. Led by the scoring power of Aaron Phipps, who lost both his legs and his fingertips after meningitis and under the sport's classification system is assessed to be the least disabled player on the team, they had a comfortable victory over Sweden (ranked fourth), followed by a thrilling and dramatic overtime win over Canada (ranked five) and a narrow success over the second-ranked Australians. But although Australia gained revenge in the final, recording a comfortable 71-48 win, GB have put down a marker ahead of the Games. Ross Morrison, who was part of the Athens and Beijing squads and who is hoping to play in his third Games in London, told BBC Sport that he has seen a massive change in the professionalism of the team over recent years. "There are no passengers - you train full-time, eat, sleep and mentally prepare and we are elite athletes in every sense of the word, which has made a massive difference," he said. "In previous Games you could never fault the heart and commitment but the level of the sport has been going up at each Games, and if you don't raise your level you won't go anywhere and that is the challenge. Winning a medal would be the pinnacle of my career and to do it at a home Games would be the ultimate dream." However, a medal would not only benefit the on-court players and GB Wheelchair rugby chief executive David Pond knows that success in London would mean a lot to the future development of the sport as a whole. "Our funding from UK Sport and Sport England has helped us put in place a very professional development system, which was something we didn't have before," he explained. "We are doing a lot of recruitment, working with the spinal units and the military rehabilitation units, and we have launched a youth pilot so, against that background, 2012 brings an elite element to the sport and attracts people's interest. "I'm very hopeful that we will be in the mix for a medal in London but I am really hopeful for 2016. The work we are putting in place now should give us good dividends." Coach Tom O'Connor, who led the team in Beijing, is refusing to contemplate another medal-less Games for his new-look squad. "It's been a massive advantage to me to have a full four-year cycle with the team. I'm almost embarrassed to think that I coached in Beijing knowing so little about the game," he admits. "Our goal is to medal in London and to secure the funding for the future of the sport. "To be honest, I don't think about not medalling. You can't let those negative thoughts come in - you have to think positive. We are hitting the targets we need to hit and we are pleased so far. "We are certainly on track for what we are trying to achieve. We have a very young squad so it is an exciting time for us."